While scouting workshop locations in Chile’s famed Torres del Paine National Park last year with good friend and fellow photographer Rodrigo Moraga, we came upon a herd of Guanaco (Lama guanicoe, a camel relative and the wild ancestor of the domesticated llama). Since it was about two hours before sunset, the light wasn’t great, and after taking a couple of grab shots, we decided to keep driving. But suddenly I had an idea and asked Rodrigo to stop. I got out and started to jog back down the road. Rodrigo asked what was up, and I told him I was going to go take a super cool photo. At least that’s what I hoped! 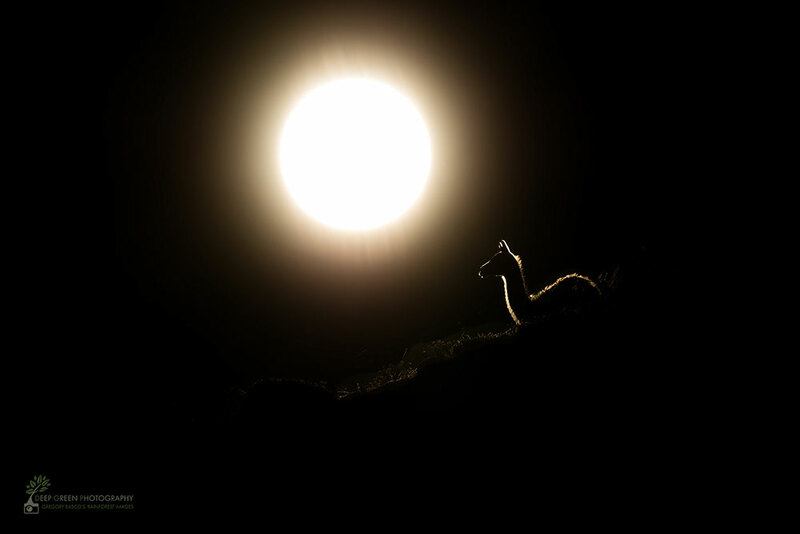 Precisely because the sun was still fairly high in the sky, I thought I could make a dramatic photo with the sun and a backlit Guanaco. Specifically, I wanted to capture an image that looked like a solar eclipse. I just needed a Guanaco in the proper spot (right on the crest of the hill near the sun), and then I needed to figure out how to meter, focus, and compose without looking through the camera. Why? I didn’t want to burn my eyes or my camera sensor! DISCLAIMER: Always exercise extreme caution when shooting toward the sun. Never look directly at it with the naked eye or through the viewfinder! Knowing the sun was absolutely blazing, I set my camera to let in as little light as possible. That meant stopping way down, lowering my ISO as far as I could, and maxing out my shutter speed. I knew that if I could get the backlight on my subject exposed properly, everything else would fall into place, with a bright looking sun and totally blocked up shadows – exactly what I wanted for this image. I took a quick test shot, and the exposure, to my amazement, was right on! Focus was the next challenge, and it was a tough one indeed as I couldn’t look through the viewfinder with the sun in the frame. I placed an autofocus point as high in the frame as possible and then focused on the grass right near the Guanaco but without including the sun in the frame. I had plenty of depth of field at f/22, and shooting at a great distance with my subject on a single plane meant that getting the focus close would be good enough. And now, for the really difficult part – how does one compose while shooting handheld and not being able to look through the viewfinder? I decided to focus as described above, estimate my desired composition, close my eyes, and then swing the camera up while firing off a burst. I produced quite a few failures but a number of keepers as well. For the image featured above, I used my camera’s 1.3x crop mode to frame the shot in-camera. On the Canon 5DsR, that still leaves me with a 30 megapixel file! Now, you might ask, why not just shoot in regular full-frame mode and crop afterward in the computer? While it’s true that the result would be exactly the same in terms of resolution, I enjoy the challenge of trying to compose in-camera. I think it’s part of the art of nature photography. Nonetheless, one of the things I like about the Canon 5DsR is that the full RAW file is still recorded at the moment of capture. So, if I mess up my framing in-camera using the crop mode, I can always go back to the full RAW file and fix things. It’s nice to have that cushion. I use Lightroom for the vast majority of my processing. For this image, however, I did nothing at all to the RAW file; it’s simply resized and sharpened to taste for presentation here. I actually tried to make a few adjustments in Lightroom, but the original exposure contained the deep blacks and bright highlights that I wanted. I toyed with the idea of trying to tone down the sun, but it began to look artificial. I much preferred the original capture so I decided to leave it alone. It’s not often that I do nothing at all to a RAW file but this shot was the rare exception! I really enjoy trying to take photos that look different from what our eyes can see. Next time you’re out in the field and find yourself with a crazy idea in your head, go for it. The worst that can happen is that you fail, and failure is a great teacher in nature photography! Just be careful to protect your eyes and your camera! 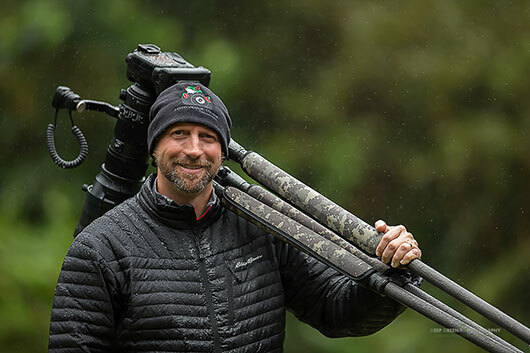 About the author: Greg Basco is a professional nature photographer and environmentalist based in Costa Rica. You can view more of his work at www.deepgreenphotography.com. If you’d like to join Greg in Chile this October, visit his photo tour company’s website www.fotoverdetours.com. I doubt that I would have ever thought to shoot this way. The result is stunning and it also spells out “less is more”. Great shot! Wow Greg, this is an amazing photo! A perfect blend of artistic vision and flawless technical execution. Thanks very much for your comments. Glad you liked it!